The annual dolphin roundup and slaughter in Taiji, Japan, which we've been covering all weekend, continues into its third day. The hunt, which was the subject of the 2010 documentary "The Cove," has stunned an international internet audience, who has, in response, targeted Japanese officials to end the inhumane practice. Sea Shepherd's Cove Guardians have beenlive streaming coverage of the hunt. (Warning: disturbing video.) It began on Friday when 250 bottlenose dolphins were herded into nets. 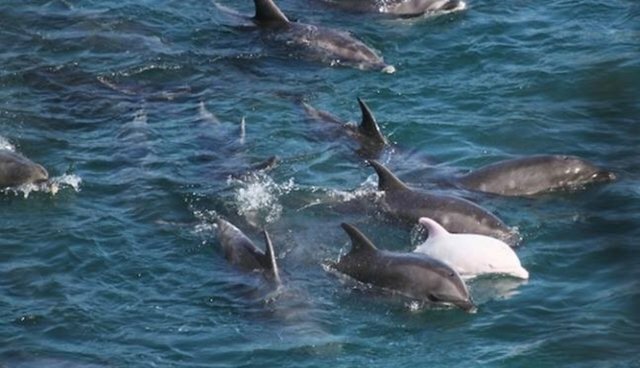 Since then, dozens of dolphins, including a rare baby albino, have been selected as candidates for captivity at zoos and aquariums. What you can do: Call and write to the authorities in Taiji as well as the Japanese Embassy in your country, the U.S. Embassy to Japan, U.S. and Japanese Ambassadors to the UN and the U.S. Senate members of the Committee on Foreign Relations, among others -- all of their contact information is on this page. Deeply concerned by inhumaneness of drive hunt dolphin killing. USG opposes drive hunt fisheries. URGENT: 250 bottle nose dolphins in Taiji cove now. #tweet4taiji please stop the slaughter. RT. Thank You.